Learn about the history of mathematics in a fun way! 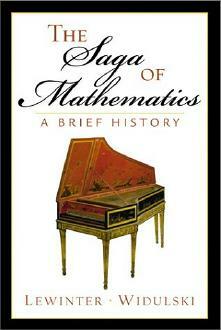 Welcome to the Web Page supporting The Saga of Mathematics. This book, publised by Prentice Hall, was released on 09/12/2001 and is currently in its first printing. The various PDF, Powerpoint, Word documents, and HTML files can be obtained by clicking on the appropriate bullet items below. Test Bank - Coming Soon! A List of Schools currently using the text. The MAA Online book review by Ioana Mihaila. The Saga of Mathematics at the Prentice Hall website. Links to other History of Math Websites - Coming Soon! If you have any comments on the material, please send mail to som_book@widulski.net.